Designed to be used on our Back Pack Sprayer only, this 48″ Boom is ideal and suited for any large job. 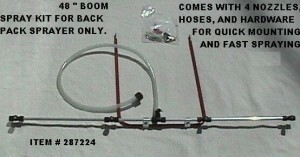 It comes complete with all the needed hardware, hoses and connectors so all you do is mount it and start spraying. The Boom itself has 4 fan pattern nozzles so that you are able to get any job done fast.